W. L. Gore & Associates, Inc. (Gore) announced the first implants in Japan of the GORE® EXCLUDER® Iliac Branch Endoprosthesis (IBE). Gore has received Shonin approval from the Japanese Ministry of Health, Labour and Welfare to market the IBE and is currently in discussion regarding reimbursement for this region. The IBE is the first off-the-shelf iliac branch solution approved in Japan and the only device indicated for the endovascular treatment of common iliac artery aneursyms or aortoiliac aneursyms. With more than 2,500 commercial implants worldwide, the device is a complete, fully engineered system (Gore designed iliac branch and internal iliac components), which received CE Mark in 2013, registration in Australia and New Zealand in 2015, and FDA and Health Canada approval in 2016. Used in conjunction with the GORE® EXCLUDER® AAA Endoprosthesis, the IBE preserves blood flow in the external and internal iliac arteries. 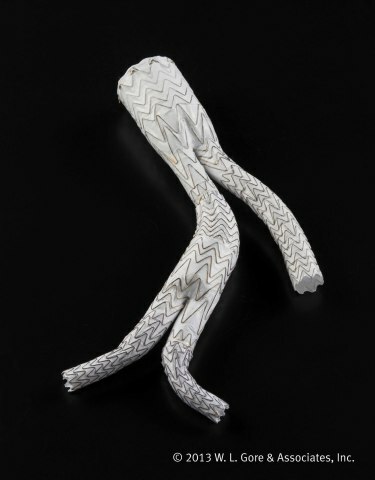 The IBE leverages the design and experience acquired from more than 20 years and 285,000 patients treated* with the GORE EXCLUDER AAA Endoprosthesis and utilizes the same durable, expanded polytetrafluoroethylene (ePTFE) graft and nitinol stent material. The IBE offers an All-in-One System with improved outcomes for the treatment of iliac artery aneurysms while preserving flow to the iliac arteries. Preservation of blood flow in the internal iliac arteries is found to avoid pelvic flow disruption and reduce the rate of complications that can include buttock claudication, sexual dysfunction, and colonic ischemia. The IBE system provides a treatment range of 6.5-13.5 mm for the internal iliac arteries, and a treatment range of 6.5-25 mm for the external iliac arteries. The delivery profile of the loaded catheter allows the use of a 16 Fr introducer sheath for the iliac branch component, and a flexible 12 Fr, reinforced introducer sheath for the internal iliac component. * Based on the number of Trunk-Ipsilateral Leg components distributed.